What is a car bed? A car bed is a unique child restraint system. Instead of holding the child in the semi-reclined position like most car seats do, a car bed accommodates them lying flat. It is not a system that should be used lightly. It is not safer than traditional car seats in general, but it certainly is for some children with special needs. A car bed is used to transport small, premature or medically fragile babies. It is not a decision you have to make unless you happen to be a medical professional in which case you can make the right call without our guidance. If you are not, be aware that it is the doctor who determines that your child needs a car bed. As a rule, when they do that, it is because of their concerns with the baby’s heart rate and breathing in the semi-reclined position. If it happens, it very likely that the child’s vitals will also be monitored by medical staff before the first ride or even after that. Do note that the following indicators are what medical staff rely on. They are not something the parents should act on, even if there is a match. But you may and should bring this to doctors’ attention should you suspect your baby needs a car bed. According to the AAP’s recommendations, a car bed is to be used for infants less than 37 weeks gestational age at birth, infants who are at risk of apnea oxygen desaturation or bradycardia, and infants who simply do not tolerate sitting in a semi-reclined position. 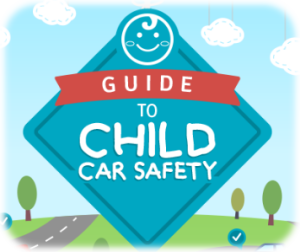 Some of the necessary safety measures concerning car beds are the same or similar to the safety measures that have to be implemented when installing and using standard car seats. Much like car seats, a car bed is to be placed in the rear seat, away from airbags. The baby’s head should be in the center of the car, as far from the door as possible. The baby should be placed on their back most of the time. The only exception is a doctor recommendation. It is possible that the baby should be placed on their abdomen instead. Once the doctor says abdomen riding is no longer a requirement, you should place the baby on their back. Unlike a car seat, a car bed requires that someone actually watches the child. Because of that, the presence of a passenger is a necessity. Long trips are not advised. If a long trip is unavoidable, make sure to stop every two to three hours to properly attend to the child and let them rest from the ride. If the baby needs medical monitoring, the equipment should be secured properly so as to prevent movement in the event of a crash of sudden deceleration. It is better to wedge any equipment on the floor or under the seat. Additionally, make sure that battery power would be twice more sufficient than needed. 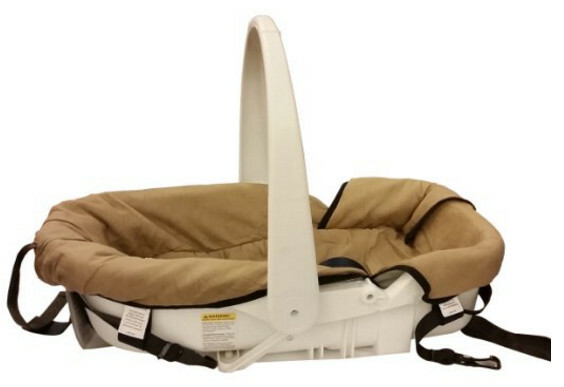 A child car safety bed is used for children who are either premature or have a medical condition that makes car seat use impossible or dangerous. That said, only medical staff can decide whether your child needs a car bed or can be put into a regular car seat. But you can bring the matter to their attention if you believe your child needs one or the other method. The Hope car bed offers more in terms of features than other car beds presented here. Please understand that it is designed to meet not just expectations of parents but also numerous medical standards and requirements which happen to be far more numerous and important than simple federal standards for safety in the event of a car crash. This car bed is a very sophisticated device you should not consider lightly. We strongly recommend that you consult a doctor first before purchasing it. Actually, you should consult a doctor before buying any safety car bed but this is especially true in this one instance. This car bed is designed for children that are not just medically fragile but have some sort of medical complication. This is one of the reasons this car bed must be as sophisticated as it is. However, it does allow traveling on stomach and even right side. That may not sound like much but things like that really matter in the grand scheme of things. The seat can accommodate children from 4.5 to 35 lbs, including children with hip casts, and comes with neck pads, tube guides, and other complimentary equipment. The Angel Ride is a good car bed. It can be used for children that weigh from 4 to 20 lbs. The seat provides basic safety and especially comfort for the child. The bed is well ventilated and is exceptionally easy to set up. As a car bed, the Angel Ride is specifically designed for transporting small and premature children, and children with special needs. The bed allows children to be put either on their stomach or their back. The car bed comes with a fully padded shell as well as a wrap-around harness. The shell, however, is made of plastic which is now quite as sturdy a material as some car seat utilize. The bed has a 5-degree head incline to facilitate breathing. The car bed would not nearly as much as the Hope car bed. 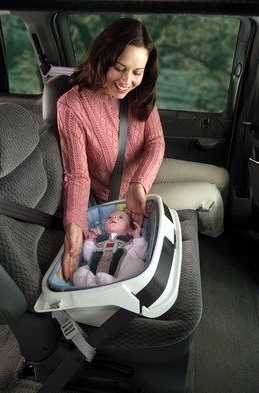 It is a good car bed, but you should transfer to a car seat as soon as you can do so without endangering your child. 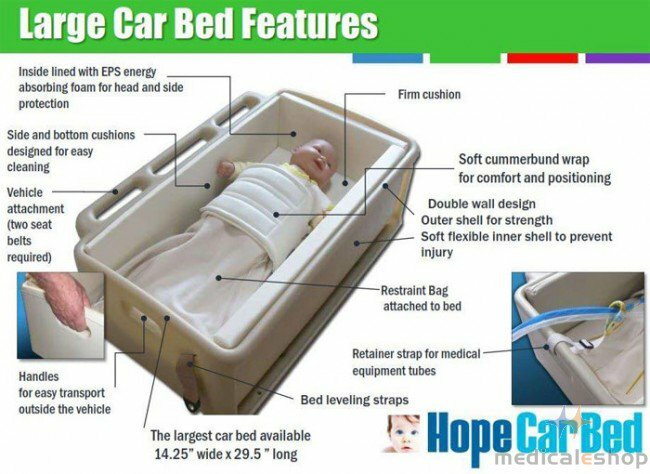 Do note that it is not designed for exceptionally fragile children, for them, the Hope car bed would be the only solution. The Dreamride is, first of all, a car seat. That what makes it stand out and that is why it is better than typical car beds. Still, it can be used as one easily as well as a child restraint system for air travel. Of course, it is not quite as good as some other car seats, but still better than other car beds. The seat is equipped with a 3-point harness. This may be less than most car seats provide, however, the seat has been thoroughly tested and meets FMVSS standards. It is also FAA approved. It can accommodate children from 5 lbs to 20 lbs. The Dreamride has been approved by the American Academy of Pediatrics for transporting preemies, low birth weight infants, babies with special needs and medically fragile infants. The seat’s price is close to moderate but still low. Of course, the Dreamride is not the most expensive car bed. It is not even as expensive as some of the car seats available, although most car seats are better than this one as far as car seats proper are concerned. However, this product’s main advantage is that it can be used as a car seat, car bed or aerial child restraint system at the same time. It makes it ideal for long travels. The number 1 seat, the “Medline Angel Ride Car Bed” entry above is all wrong. There is no Medline Angel Ride. What you picture and refer to is the Angel Guard Angel Ride, which was already listed as number 3 above. The information is basically correct, but it is the same seat and the first one listed. It certainly does not cost over $900, but rather $100. What you are missing is the Merritt Manufacturing Hope Car Bed, which accommodates a child up to 35 lb.s and takes up two full seating positions. It is specifically for medically complex children (such as kids with osteogenisis imperfecta, hydro cephalus, spina bifida, etc.) It is more expensive, but is radically different that this strange Medline entry. You should rewrite this article to correct the above and include the Hope Car Bed.